If you’re in NC like we are, in the past week you made it through primary voting, St. Patrick’s Day weekend, and the first (chilly) day of spring. Congratulations, now unwind with some social media highlights from the week. Puppy video? Yes please! Slow motion puppy video? Even better! Whether voting day made you excited or exhausted, this look at the rise of North Carolina Republicans is sure to be of interest to voters statewide. Not quite ready for St. Patrick’s Day to be over? We can recommend some green books for you. Asheville loves this banjo-playing author of Bearwallow. Spring has sprung! If you’re gearing up for a scenic road trip perhaps this vintage poster for the Blue Ridge Parkway will help you pick a destination. Today is World Poetry Day so curl up with some nice verse tonight. We’re back with Byte-Size Blair, our weekly wrap-up of all things social media. If you’re not already following us on Facebook, Twitter, Pinterest, and Instagram, give us a look. In the meantime, enjoy this collection of posts. Today is Pi Day! Celebrate by making this delicious buttermilk pie from chef Stephanie L. Tyson at Sweet Potatoes restaurant. Award season has begun in the book industry. Check out these talented Blair finalists. For Women’s History Month and International Women’s Day we’re proud to share this Essence interview with author and activist Sybil Haydel Morial, author of Witness to Change. Fun and educational, here’s an infographic about book cover design. Seeking creative indie booksellers who explain the industry with puppets? We’ve got you covered. 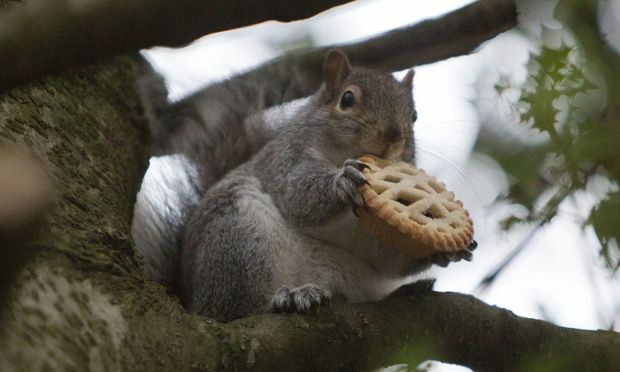 Now go enjoy some pie like this little guy! Tomorrow is National Library Workers Day…now that’s a celebration that we can get behind! Tiya Miles is back at it with an article about Easter on Huffington Post’s Black Voices. These chicks just might be our spirit animals! Bob Garner’s book received a wonderful review by the The Sun News. We want to nurture a love of literature in everyone – regardless of age or experience with books. What books did you read this weekend? We’d love to hear about them! That’s all, folks! Get outside and enjoy those blooms!